This was a very easy day, hiking only 45 minues up the hill from Jharkot to Mulktinath, where we stayed in a more primitive guest house (Asian-style toilets, 3 beds shoehorned into a room meant for two, one sink for all to use outside, pay-per-use propane-fueled shower) but with a fantastic 270-degree view of the peaks around. Mulktinath is a holy pilgrimage site for both Buddhists and Hindus, and has the requisite Vishnu temple, Buddhist gompa, and Buddhist nunnery. Since Mulktinath is almost the first point of civilization for people descending from the highest point of the full Annapurna circuit, it has also blossomed in the last few years (since the most recent Lonely Planet, even) with fancy new guest houses and scores of Tibetan refugees selling hand-woven belts, hand-knit hats, and scarves which may or may not be handwoven pashmina or yak fur. We ran the gauntlet of scarf-sellers and made it to the temple, where Bina, our guide, observed devotions and showed us how it is done. She and Bandana, one of the assistants, had brought empty plastic liter bottles and carefully filled them with water from each of the 108 spouting bull’s heads fountaining around the Vishnu temple. She also tied a lucky mallahi string around each of our necks and gave us each a tika – the red dot in the center of the forehead. We also were admitted to the most sacred site, which is an eternal flame burning from a natural gas vent next to an underground river – this combines the sacred elements of earth, air, fire, and water in a way which is thrilling to Hindus and Buddhists alike. 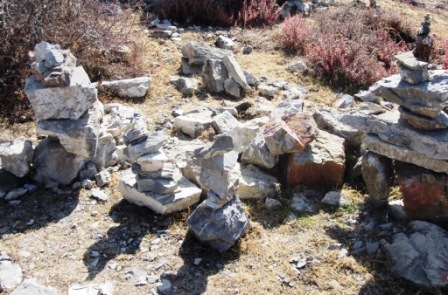 The hills behind the site are a spider web of prayer flags; the path up to the site is lined with stones piled one atop another – these are believed to be homes provided for souls which have not yet found their way to judgment, so building a nice one for yourself in afterlife is a good investment of time – especially if you need to pause for breath while climbing the stairs at 3800 M.
Following our descent and our mollifying the sellers by purchasing several scarves, necklaces, and whatnot, we made it back to the hotel for lunch. After lunch DM and I visited a Buddhist monastery (brand new and painted lavender, for some reason). 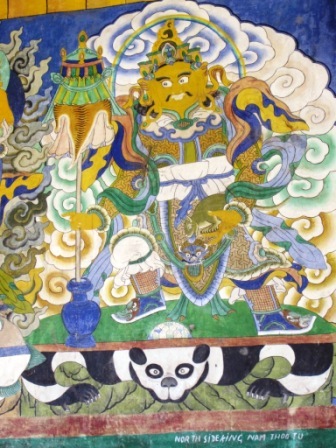 Murals outside the shrine depict the “King of the North (China), yellow-skinned and standing on a panda. The King of the West is pale-skinned and stands on a Lion – influenced by early British contact, maybe? The King of the East (Tibet) stands on a tiger, while the King of the South – the Kathmandu region relative to Mulktinath – stands on an eland. Inside the shrine has the usual portraits of current and former Lamas, but the monastery is down to only five monks. In town DM and I did our best to send some email. 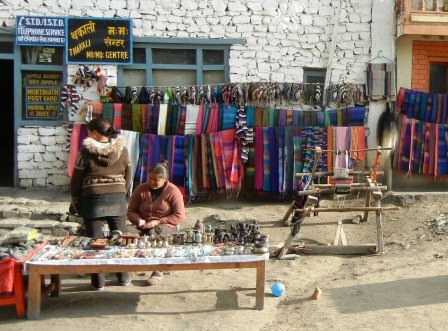 The young man who runs the internet café spends the winter months in Kathmandu playing in a band; in the trekking season he spotted an opportunity and set up the internet café in Mulktinath – but the connection is iffy before 6PM because of the limited power allowance in the mountains. In the evening the three of us and two of the guides drug out a battered deck of cards and played gin rummy and a new game called “five-or-less” to great laughter. There is something universal about a deck of cards; I wish we’d discovered this sooner.